Although a user is visiting a business website or a mobile application they feel more attracted towards that website or app and also like to use and visit the site again and again just due to its attractive and smooth nature. Expect all the other in-built features of a website or application, the sweet simple animations like fade-in, fade-out, scale, etc., That is added in a web app allure the users heart and encourage them to visit again. So, seeing the users interest you can add several effective animations in your Xamarin.Forms. 1. 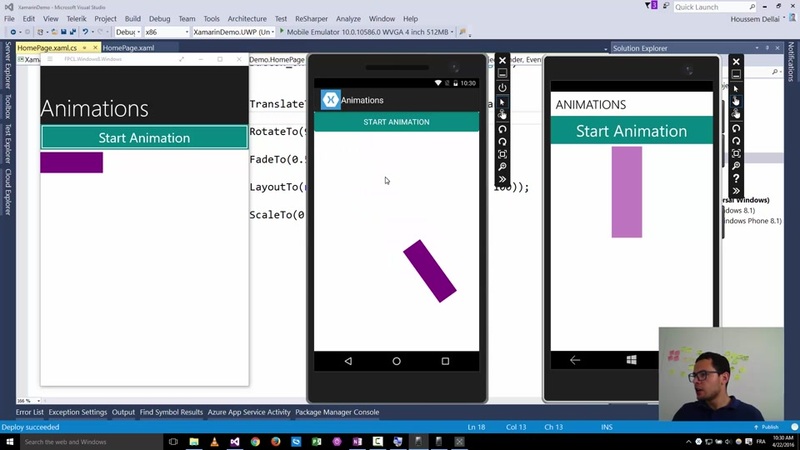 At first, create a new project in Xamarin.Forms and then create UI in XAML. See the code below. 2.Now, open your xml.cs file and write the below mentiond code usinf C# coding language. Easing has a huge list of animated effects you can check the list and use any particular effect in your Xamarin.Forms app as per your choice. The list has the effects like BounceIn, BounceOut, FadeIn, FadeOut, CubicIn, CubicOut, Equals, etc. As Xamarin is a cross-platform technology and allows the reuse of code, hence, you did not need to write the same code again and again for another applications.